The fifth anniversay of British Petroleum's Deepwater Horizon oil spill has just passed. Could such a devastating oil spill happen in Australia? Conservationists with the Wilderness Society and other environmental groups say it is a distinct possibility, off Australia's southern shores in the Great Australian Bight. And it is British Petroleum (BP) again in the hot seat with exploration licences about to do some deep sea exploratory drilling. Wilderness Society director, Peter Owen, told the ABC: "The potential of oil all over South Australia's beaches was not Colonel Light's vision for South Australia," he said. "This is high risk. Why are the people of South Australia being asked to carry the risk for these big companies whilst they refuse to disclose their oil spill modelling, their plans to respond to an emergency?" "In order to get that approval they [BP] have to consult with the community yet they are refusing to disclose any oil spill modelling, they're refusing to disclose any oil spill emergency planning. They are not being transparent with the people of South Australia." said Owen. "We are confident that when we publish the clear, complete and accessible summary, it will satisfy the needs of our stakeholders and inform discussion," a BP spokesperson told the ABC. "This area has the greatest diversity of marine life anywhere in the world, including the Great Barrier Reef. Less than 1% of the marine life in this area is protected from oil and gas operations, but up to 90% of the marine life is found nowhere else in the world. The area is globally significant for sperm whales, blue whales, beaked whales and southern right whales, as well as great white sharks.... The area is also immediately south of the Marine Mammal Protection Zone well known as the place where southern right whales meet to breed and calve." The exploratory licences cover parts of the Great Australian Bight Marine Park and sections of the Benthic Protection Zone within the Great Australian Bight Marine Park. This area is recognised as having high conservation values. 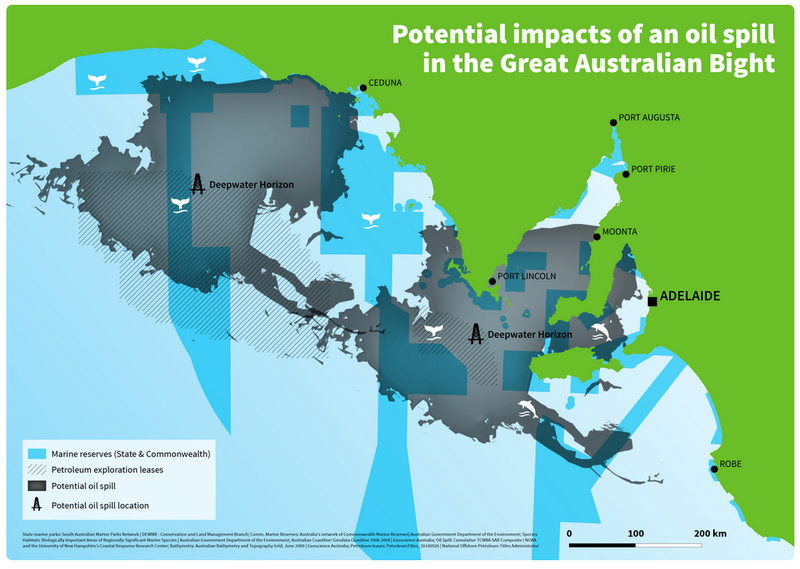 "Any operations that fall within the Great Australian Bight Marine Park zone will require approval from the Governor-General in accordance with the Great Australian Bight Marine Park (Commonwealth Waters) Management Plan 2005-2012." says a South Australian Government website on the Grant of Petroleum Exploration Permits to BP Exploration (Alpha) Ltd.
BP's four exploratory oil and gas permits in the Great Australian Bight were awarded in 2011 by the Australian and South Australian Governments. The permit area also covers part of the benthic marine park. The proposed drilling area in the Bight has water depths of approximately 1000 to 2500 metres. The Wilderness Society questions BP's preparedness and highlights the level of negligence in the Deepwater Horizon case. "We understand that BP is assuming that they can stop any oil well blowout in the Great Australian Bight in 35 days. In the Gulf of Mexico oil spill BP took 87 days to stop the leak. And the seas in the Great Australian Bight are more remote and much more wild. We think they are seriously underestimating the risk." says the Wilderness Society website. BP's Deepwater Horizon rig in the Gulf of Mexico was drilling at a sea depth of 1600 metres, when the catastrophic explosion occurred which resulted in the rig sinking. The initial explosions killed 11 people. But the resulting sea-floor oil gusher flowed for 87 days and was the largest accidental marine oil spill in the history of the petroleum industry. The oil spill resulted in extensive damage to marine and wildlife habitats and disruption to fishing and tourism industries. The worst marine oil spill in Australian waters occurred off the Kimberley coast of Western Australia: the Montara oil spill in 2009 in the East Timor Sea. It took 74 days and 5 attempts until the well was successfully plugged. It is estimated that between about 4,000 tonnes to 30,000 tonnes was lost from the well to pollute the marine environment, but most of the environmental damage was to deep sea ecosystems with no oil damaging the western Australian coast. It is considered to be the worst oil disaster in Australia's history so far. So what would happen if there was a similar substantial blowout while doing exploratory drilling in one of their exploratory permit areas off the South Australian Coast? A Wilderness Society map shows a superimposed image of the Deepwater Horizon disaster on a map of the South Australian coast. Of course currents and winds would probably change an oil spill impact, but it gives you some idea of how much of the coastal environment may be affected if something major was to go wrong. Of course none of the licensing approvals refer to the oil and it's contribution to greenhouse gas emissions from new sites such as in the Great Australian Bight. According to McGlade and Ekin, 2.7 billion barrels of oil or 46% of known reserves in the OECD Pacific region - Australia, New Zealand, Korea and Japan - need to remain unexploited. Natural gas percentage is 51 per cent and coal is a staggering 95 per cent of known reserves that needs to remain in the ground, unburnt. Perhaps it won't be long before we see Greenpeace activists swarming the new BP rig before a team scales the structure to unfurl banners in nonviolent protest at endangering the South Australian marine and coastal environment, and indeed, the global environment through climate change. A 'Save the Whales' banner would indeed be appropriate for the occasion.